Eija-Liisa Ahtila, Horizontal, 2011, 6-channel digital projection with 5.1-channel audio, six minutes, 10 x 34 1/2'. A portrait of a tree is a fairly straightforward concept. Realizing this image photographically, Finnish video artist Eija-Liisa Ahtila discovered, is easier said than done. While filming The Annunciation, 2010—wherein an all-female cast rehearses and enacts that biblical scene—Ahtila wanted to include a shot of a single tall tree. This vision, however, proved problematic. At close range her camera would capture only a section of the tree, from afar she would wind up with a landscape, and a wide-angle lens would cause distortion. 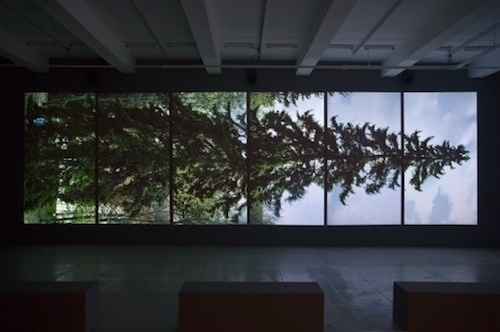 Her solution, Horizontal, 2011—a lateral presentation of six video projections showing consecutive segments of a spruce from roots to wind-blown branches—is emblematic of Ahtila’s innovative cinematic storytelling. In addition to jumping from screen to screen, Ahtila’s narratives skip through time, across multiple locations, and between reality and fantasy. This Faulkneresque style is particularly well suited to the exploration of agoraphobia in The House, 2002. As a young woman’s psychosis worsens, her suburban home becomes invaded by increasingly surreal imagery. When a cow escapes her TV set and lumbers through the living room (as embodied by three large screens), the viewer’s sense of spatial reality is tested as well.